The genius of William Morris found expression in many different media. Here, for the first time, we have reproduced one of his gems of manuscript illumination: The Odes of Horace, a treasure of the Bodleian Library in Oxford. The printing of these delicate pages was entrusted to Castelli Bolis in Bergamo, Italy, who are specialists in gold-foil printing, and the binding to the craft bindery of Smith Settle in Yorkshire. Each detail – from the varied shades of gold in the decorations to the green-black tone of the goatskin binding – has been reproduced with meticulous care to match as closely as possible the original volume. The book is housed in a decorated solander box, alongside a handsome commentary volume. This essential companion contains a full-verse translation by William Gladstone and an absorbing essay on the genesis of the book and the unfolding of Morris’s passion for illumination. The Folio Society's facsimile edition of William Morris's The Odes of Horace; the binding of this beautiful book was undertaken by Smith Settle Printing and Bookbinding in West Yorkshire. Here you can watch how they bring the finishing touches to a Folio Society book. 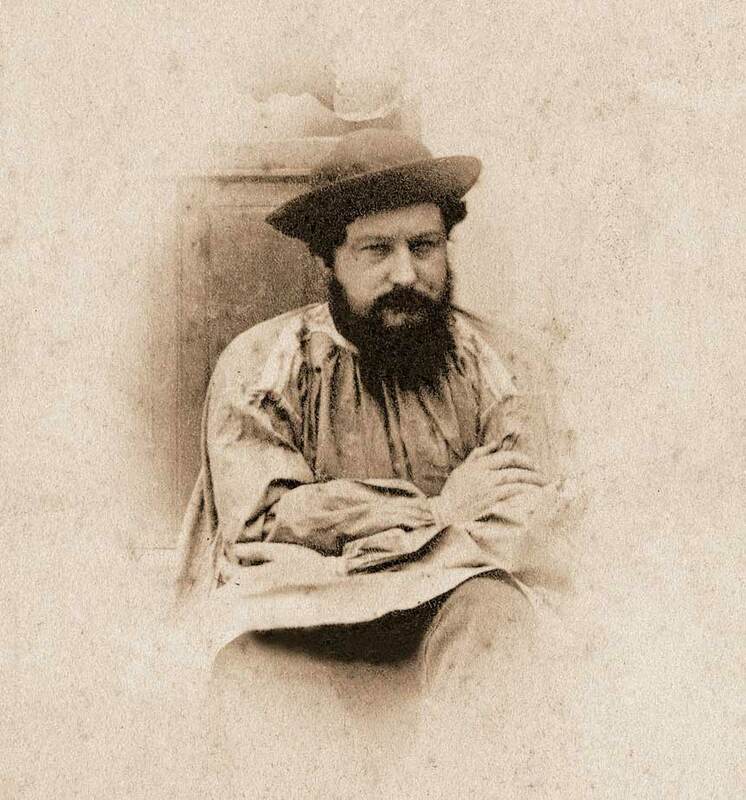 The vision behind William Morris’s entire creative output hinged upon a vehement aversion to what Walter Benjamin described as ’the age of mechanical reproduction’. His illuminated manuscripts typify this belief. Beautifully calligraphed and intricately ornamented, they stood in defiant opposition to what Morris perceived to be the drab and soulless fruits of modern labour. He believed in the assiduous creation of beauty, both for its own sake and as a path to wisdom; and the delicate art of illumination was, for him, a means of pursuing this ideal. Between 1869 and 1875, Morris produced 18 illuminated books, resurrecting a tradition that had faded with the invention of printing at the end of the 15th century. Among these were A Book of Verse and the Rubáiyát of Omar Khayyám and two of the greatest latin texts: The Aeneid and The Odes of Horace. Morris included all four books of The Odes, the last of which, in its unfinished form, provides a fascinating record of his creative method. As young men, Morris and his friend and collaborator Edward Burne-Jones – who would later become one of the great Pre-Raphaelite artists – had been deeply influenced by John Ruskin’s The Stones of Venice, in which Gothic architecture is presented as not merely aesthetically but philosophically superior to all other styles. In each of Morris’s many projects – from the interior design of the Red House, his home in Kent, to the incomparable Kelmscott Chaucer – he was intent on crafting objects of deeply considered, lasting beauty. He was horrified by the joylessness of the production line, seeing it as antithetical to the chief pleasure in life: the enjoyment of labour. The creation of beauty, whether in architecture, books or furniture, was fundamental to Morris’s humanist philosophy and to the political beliefs which eventually made him a figurehead of the socialist league. Like all of his work, Morris’s illuminated manuscripts are bound up in this radical world view. Morris’s fascination with illumination began early in his life. While studying at the University of Oxford in the early1850s, he often visited the Bodleian Library to study the manuscript collection. Fittingly, the same library now houses his Odes of Horace, though up until now it has been something of a hidden treasure, rarely available for public view. Having experimented with pseudo-gothic scripts in the 1850s, he went on to teach himself calligraphy, mastering the art with typical rigour and flair. He also acquired his own collection of 13th- and 14th-century manuscripts, and became an advisor to the British Museum on the purchase of such artefacts. Morris learnt from 16th-century writing manuals, shifting his focus from medieval models to Renaissance and Persian examples. His goal was secular fulfilment, rather than the monastic ethos of self-abnegation and patience associated with medieval illumination. For Morris, the art of meticulously crafting each letter and adorning each page gave the written word the hallowed form it deserved. 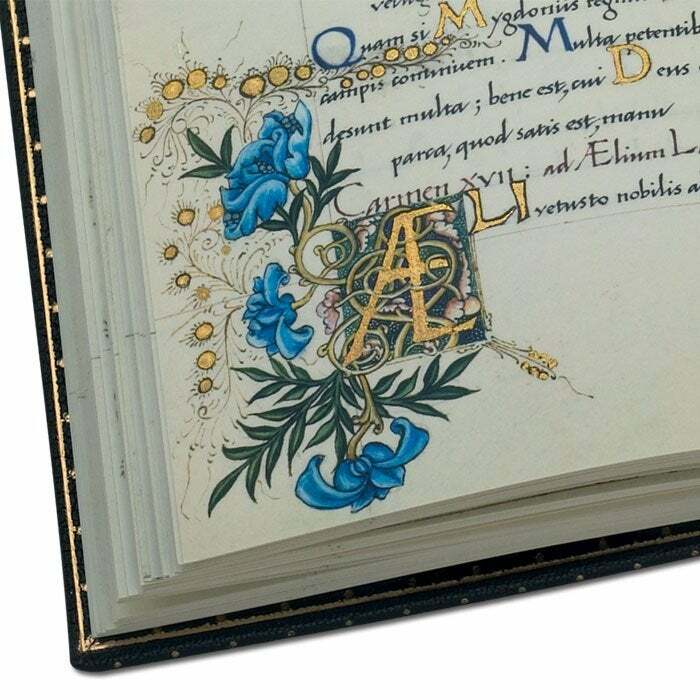 As John Ruskin argued, illumination made the book ‘a noble and sacred thing, to be respected and revered’. Each of Morris’s ‘painted books’, as he called them, is an object of delicate beauty. Mostly incomplete, they are remarkable both in their artistry and grace, and as records of Morris’s bid to revive this ancient art form. The Odes of Horace manuscript was produced in 1874, a difficult period in Morris’s life: his wife Jane had begun an affair with his friend, the painter Dante Gabriel Rossetti, and it may be that absorbing himself in this project was in part therapeutic. His daughter May described illumination as a ‘serene and contemplative’ activity in which he immersed himself. Each of the four books of The Odes opens with a display page in a markedly different style from the rest of the book. These pages – which are in varying degrees of completion – were created in collaboration with Edward Burne-Jones and Charles Fairfax Murray, and are among the most elaborate illuminations Morris ever created. Profusely decorated, they combine glistening floral patterns with images of idealised human faces and figures. The calligraphy is a version of Renaissance italic, while the floral decoration is closest to the Persian model, prefiguring the tapestry Morris would create five years later at Kelmscott Manor, and the foliated borders of the Kelmscott Press books. However, this gem-like private volume has an ethereal quality quite unlike those later creations. Horace was perhaps the most popular Latin author of the Victorian age – graceful, balanced and astute, he was seen as representing the values of the Victorian gentleman. He lived during the reign of Augustus, between 65 BC and 8 BC, and is regarded as the finest Roman lyric poet. His influence has been tremendous, not least in the work of John Keats, Christina Rossetti, Robert Frost, and Edward Fitzgerald in the Rubáiyát. The Odes consist of more than 100 short poems adapted from the lyric verse of Greek poets such as Pindar and Sappho. Their themes are diverse – from love and friendship to patriotism and religion – and they often have a strong moral vein. Alfred Tennyson described them as: ‘jewels five-words long, that on the stretched forefinger of all time / sparkle for ever’. Today they are widely quoted: ‘carpe diem’ (‘seize the day’) and ‘dulce et decorum est’ (‘sweet and fitting it is’) are but two famous examples. Ovid’s epic poem is brought together with Titian’s paintings for the first time in this landmark publication.